High above the Neckar valley and on the edge of the city of Stuttgart, in the district of Vaihingen, Stuttgart Media University has its main Campus. 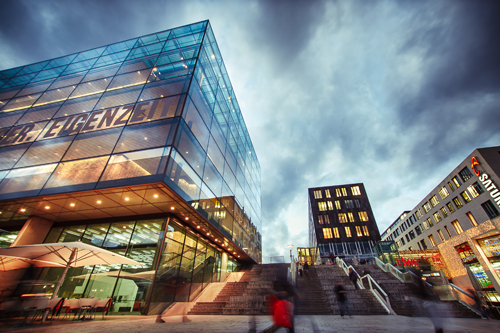 In the immediate neighbourhood, the Mensa (cafeteria), student accommodation and numerous research institutes can be found, only three tram station from the city centre. 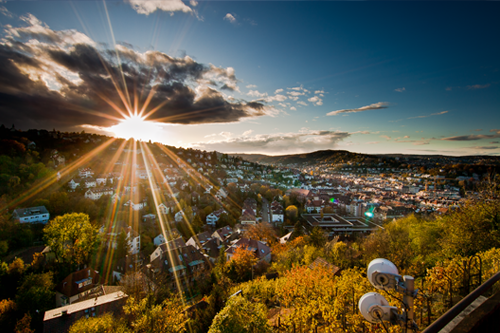 As the capital city of Baden-Wuerttemberg, Stuttgart has a lot to offer and is an attractive city to live and study in. Over 40,000 young people study at universities in the Swabian metropolis. Many local companies and institutions offer attractive workplaces in industry, and in the service and media sectors: Mercedes-Benz, Porsche, Bosch, Klett, SWR or Motor Presse Stuttgart are located here. Additionally there is a great range of cultural offers: alongside the State Gallery, the State Theatre – with plays, ballet and opera – the Wuerttemberg Museum and Art Museum as well as several cinemas, the city is also renowned for its music scene. Max Herre was born in Stuttgart and the bands Massive Töne, Freundeskreis, Fanta Vier and Cro come from Stuttgart. 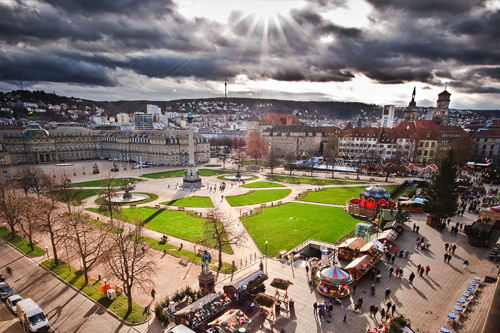 Stuttgart’s main public attractions include, alongside the TV tower, the Wilhelma Zoo, the Old Castle, the Mercedes Benz Museum, the Weissenhof Quarter or the Cannstatter Wasen (festival area). Stuttgart’s location in the Neckar valley, surrounded by vineyards, close to the Swabian Alps and Lake Constance, offers attractive outdoor leisure activities – in summer and in winter. The nearby towns, including Esslingen, Tuebingen or Ludwigsburg, are also well worth visiting.